How the hell do I get 500 words out of this one. A good chunk of previous posts regarding Super Dragon Ball Heroes I’ve written have talked about the amazing concepts that could come from a series like this. It already exists in the form of the ads. Yet, once again, this show fails to impress. With such a brief run time, you’d expect the show to be a series of quick-fire punches, throwing entirely different concepts at you, then quickly dropping them and moving to something new. This is the third (of the four) episodes to focus on the fight with “Cumber”. And it’s so boring. I’m starting to feel like I had the wrong idea about this show was before I started watching it. I was expecting more of the things like Golden Cooler, Vegeks and Super Saiyan 4. But in this episode, we got to see the Deviant Art insert character show up and Gary Stu the situation. I didn’t have anything against Fu when he first showed up in Dragon Ball Xenoverse 2, but his appearance in this episode felt a little self indulgent. 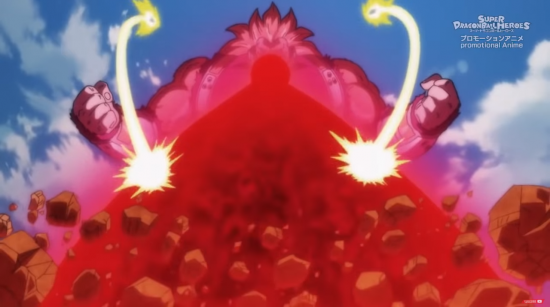 As far as this episode goes; a kaioken blue Vegito was still not enough to combat Cumber, let alone him in great ape form. Vegito is forcibly defused, Goku and Vegeta try to fight him off along with Cooler, but to no avail. Because Cumber is so powerful, he is destroying the barriers that are keeping everyone trapped on the Prison Planet, much to his own frustration, Fu decides to intervene. This is where the Gary Stu aspect of the character becomes really apparent. Never mind that he is already some bespectacled elf/demon dude with carries a katana and has time travel powers. 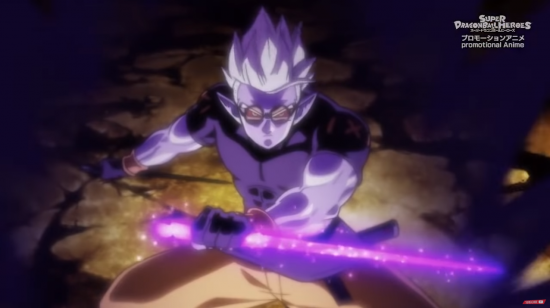 Now he apparently has his own Super Saiyan looking transformation, as well as the power to quickly destroy Cumber’s energy moon and revert him back to his base form with an ease and swagger that not even Kaioken Blue Vegito could manage. For a while, I felt Fu was an ironically inspired character, made to embody and ridicule the fan base’s tendency to create overpowered insert characters. It would be a pretty Toriyama thing to do. I failed to detect any irony in this episode. 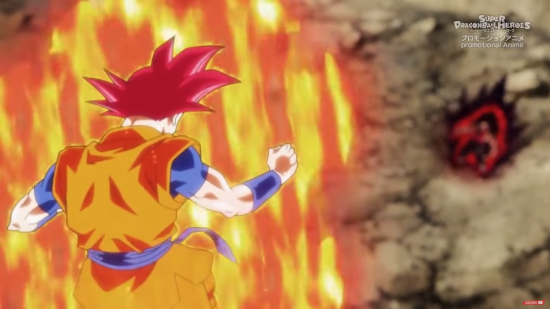 It ends with Goku turning into his red Super Saiyan God form and Cumber recognising the colour of his hair from somewhere. 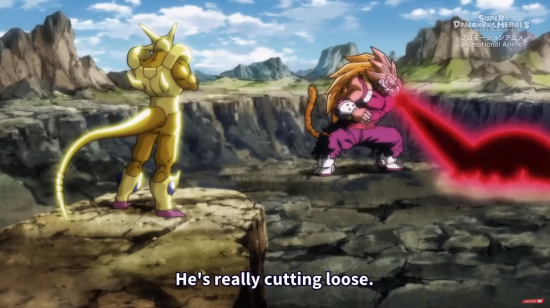 Then we get a teaser for a Super Saiyan 4 Vegito in the next episode… really?! You’re going to drop that at the end? Then what was the purpose of this entire handful of minutes. I’m ready to make a verdict about Super Dragon Ball Heroes: It’s bad. Yes; it’s only a few minutes long, yes; it’s only there to promote a game, and yes; I’ll continue watching it. But it doesn’t mean this is worth watching. The series would have been better served as an anthology, taking the created forms, fusions and other “what ifs” from the game ads and just fleshing them out into a brief story. Plucking them from various parts of the game’s story line to and giving them just enough context so to allow them to exist in a vacuum. It’s difficult to justify why a show with such a brief run time and no real impact on the main canon can’t be better than this. Posted on October 4, 2018 by WooderonPosted in Anime, Condensed Reviews:Tagged akira toriyama, cumber, dragon ball, fu, goku, promotional anime, super dragon ball heroes, super saiyan, vegeta.